Influenza (flu) and strep throat may seem like one and the same, but they are two very different illnesses and the primary distinction is the origin of the disease. The flu is caused by a virus and strep throat is caused by bacteria. Strep throat and influenza may also share some symptoms, but the key symptomatic differences help to tell them apart in diagnosis. Both illnesses are highly contagious and can result in harmful complications – especially for at-risk groups like seniors, children, pregnant women, and those with weaker immune systems. Anyone at any age can contract either the flu or strep throat, and there is treatment available for strep throat – unlike the flu. Here we will outline the similarities and differences between strep throat and the flu to help you obtain a clearer understanding of the two. As mentioned, strep throat and the flu can have similar symptoms, but if you want to know for sure which one you have, look into a mirror and say, “AHH.” What you are looking for is redness of the tonsils and white spots, on top of having a sore throat, of course. This is a big difference between the flu and strep throat. The flu can cause a sore throat redness, but white patches in the throat will not occur – this is a sign of strep. Furthermore, nasal congestion and a cough are very rarely experienced in strep throat, but are more common in the flu. For an exact diagnosis, visit your doctor for a throat swab to detect cultures. Overview Viral infection, attacks your respiratory system – mainly nose, throat, and lungs. Bacterial infection makes your throat feel sore and scratchy. U.S. Prevalence (annually) -5 to 20 percent of population infected. -Estimated 9,000 to 11,500 cases. -More than 200,000 people hospitalized and about 36,000 people die of flu complications. -Deaths from invasive cases of strep throat occur in 10 to 15 percent of patients. -Most deaths occur in people over the age of 65. -Most common among school-aged children, but adults may still develop it as well. Types Types of influenza viruses: A, B, and C. Streptococcal infections are of 2 types: Group A and Group B. Affected body parts The flu affects the upper and lower respiratory tract (e.g., nose, throat, bronchi, lungs). Throat and the tonsils. Symptoms Fever, cough, sore throat, runny or stuffy nose, muscle or body aches, headaches, fatigue, and in some cases nausea, vomiting, and diarrhea. Sudden high fever, sore red throat, white spots on the throat, headache, chills, loss of appetite, swollen lymph nodes in neck, and difficulty swallowing. Symptoms of strep throat may appear within 5 days of exposure to bacteria. Causes Caused by influenza virus types A, B, and C. Caused by bacteria known as group A Streptococcus. Both type A and type B flu viruses are responsible for the seasonal outbreaks of flu. Influenza B viruses circulate widely only among humans. Complications If the flu is left untreated, it can result in complications – bronchitis, pneumonia, aggravation of other conditions, sinus infection, and ear infections. Spread of infection – tonsils, sinuses, skin, blood, middle ear.Inflammatory reactions – scarlet fever, inflammation of the kidney (poststreptococcal glomerulonephritis), rheumatic fever. Diagnosis Most cases of the flu are self-evident. 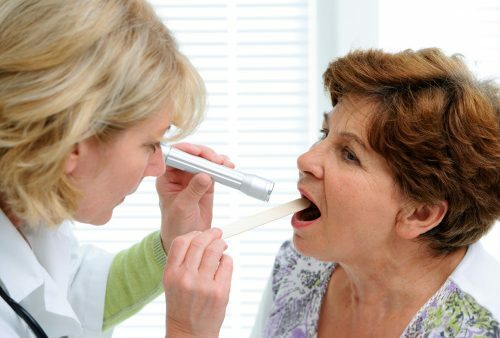 However, doctor can take samples using a swab from the nasal passages or throat within 4 days of the first symptoms. Examine throat and check for signs of inflammation, check your neck for swollen lymph nodes, doctor can send you for a rapid strep test. Treatment Bed rest and plenty of fluids, antiviral medication such as oseltamivir (Tamiflu) or zanamivir (Relenza) Oral antibiotic such as ibuprofen (Advil, Motrin IB, others) or acetaminophen (Tylenol, others), aspirin for children. Influenza is a seasonal illness, taking place predominately during the late fall and winter. The annual rate of influenza worldwide is five to 10 percent in adults, and 20 to 30 percent in children. During the peak flu season, hospitals can be overwhelmed with patients. The impact of pandemic results in high numbers of absenteeism and productivity losses. There are an estimated 9,000 to 11,500 cases of strep throat in the U.S. annually. Deaths from invasive cases of strep throat occur in 10 to 15 percent of patients. Strep throat is most common among school-aged children, but adults may still develop it as well. Symptoms of strep throat can vary in severity and even from person to person. Common symptoms of strep throat include a sudden high fever, sore red throat, white spots on the throat, headache, chills, loss of appetite, swollen lymph nodes in neck, and difficulty swallowing. Symptoms of strep throat may appear within five days of exposure to bacteria. Common symptoms of the flu include fever, cough, sore throat, runny or stuffy nose, muscle or body aches, headaches, fatigue, and in some cases nausea, vomiting, and diarrhea. Influenza is transmitted from person to person and can travel up to six feet. The flu travels through droplets when a person coughs, sneezes, or talks. The transmission takes place when these droplets enter the mouth or nose of another person. The flu may also be transmitted when you touch a contaminated object and then touch your nose or mouth. There are three main strains of influenza – A, B, and C – and the annual vaccine combines different varieties of circulating strains in order to offer optimal protection. The flu is highly contagious, and a person can infect others even being unaware of having flu. The flu is most contagious between one day prior to the symptom onset and up to seven days of becoming sick. Strep throat is caused by bacteria known as group A Streptococcus, more specifically, Streptococcus pyogenes. The bacteria invade the pharyngeal tissue, causing inflammation. These bacteria are highly contagious and can be transmitted through droplet contact or food and drink sharing. Risk factors for the flu include being under the age of five or over 65, being pregnant, being obese, residing in nursing homes, having asthma or neurological and neurodevelopment disorders, chronic lung disease, heart disease, blood disorders, endocrine disorders, kidney disorders, liver disorders, metabolic disorders, and having a weakened immune system. If the flu is left untreated, it can result in complications and can even be life-threatening to certain age groups, including seniors. Complications related to the flu are bronchitis, pneumonia, aggravation of other conditions, sinus infection, and ear infections. Being of young age is a risk factor, as strep throat is most common in school children. Keep in mind that bacteria tend to flourish during early spring and late fall, so the risk of contracting strep throat is much higher during this time. Strep throat is treatable, but if left unattended it can result in complications, including infection of the tonsils, sinuses, skin, blood, and middle ear, along with inflammatory responses such as scarlet fever, inflammation of the kidneys, and rheumatic fever, which is a serious condition that can affect the heart, lungs, and joints. The main treatment recommendations for influenza are plenty of rest and the replenishment of fluids, especially if the patient has diarrhea or is vomiting. In some cases, your doctor may prescribe antiviral medications, usually if influenza is quite severe. If these medications are taken fairly soon, the duration of the illness will be shortened. It’s important to note that influenza medications do not cure the flu, but simply shorten the duration of the illness. Some of the drugs, however, do come along with some side effects, which may be reduced if you take your medication with food. The first line of defense against influenza is getting the annual flu shot. To reduce your risk of contracting influenza or spreading it, you should wash your hands frequently and thoroughly or use alcohol-based sanitizers when soap and water are not available. Cover your coughs and sneezes with your sleeve or a tissue, and avoid large crowds, especially during the flu season. If you are sick, take the time to stay home and avoid contact with other people to prevent the transmission of the infection. Diagnosis of strep throat is done through a physical examination where your doctor will take a look at your throat and check for redness, white spots, and swollen lymph nodes. Furthermore, your doctor can take a culture swab of your throat – results can be revealed within five minutes to determine the bacteria causing your discomfort. If the rapid throat swab is negative but your doctor still suspects strep, it can be sent out to a lab for further testing. Strep throat is most commonly treated with antibiotics, as it is caused by bacteria. The prescribed treatment course should be finished even if you begin to feel better within the first couple of days. There are home remedies you can try to ease your sore throat, including drinking plenty of cold and warm liquids, using a cool mist humidifier, taking over-the-counter pain relievers, taking throat lozenges, and gargling salt water.